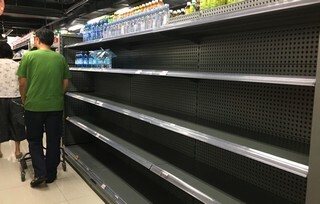 Macau is running out of bottled water as people empty supermarket shelves before Super Typhoon Mangkhut arrives, an event that will be preceded by the hoisting of typhoon signal No 10. Empty shelves are common in supermarkets in low-lying areas of the Macau Peninsula such as Patane and Tarrafeiro in the Inner Harbour area. Bottled water with lower prices such as Watsons was the primary target of Macau people and quickly sold out, while more expensive water such as Evian are still in stock. Macau residents remember how they suffered after August 23 last year when Severe Typhoon Hato swept Macau, resulting in typhoon signal No 10 and causing 10 deaths. Water and power supply stopped for several days in certain districts, especially in the Inner Harbor area and Rua de Cinco de Outubro, where floodwaters rose above the first floor, damaged electricity substations and caused choked water pumps. Supermarkets have bought extra food and water from wholesalers to meet skyrocketing demands. The Economic Bureau and Consumer Council leaders had a meeting with retailers and wholesalers of food and water yesterday, warning them not to increase prices, as they did after Hato, when a bottle of water sold for 100 patacas and a lunch box 150 patacas. The acting deputy director of the Meteorological and Geophysical Bureau, Tang Iu-man, said the impact of Mangkhut on Macau would be similar to that of Hato. The bureau would hoist signal No 10 if Mangkhut passed within 200 kilometers of Macau. A serious flood could result as the sea level in the Inner Harbor was two meters higher than normal. Normal sea level of the Inner Harbor on Sunday would be 2.5 meters at high tide, while the coast of Inner Harbor would be 3.1 meters from the sea bed, Tang said. Tang said the impact would be more severe if Mangkhut landed west of the Pearl River estuary. After the fatal flood last year, the government promised to build a flood prevention wall 1.5 meters high and two kilometers long along the Inner Harbor area to stop sea water from rushing into the streets, but nothing has been built so far. The director of the Marine and Water Bureau, Wong Soi-man, said last week that the design was almost done and it would call a public tender soon. Macau legislator Ella Lei Cheng-i of the Federation of Trade Unions said the forecast and preparatory work of the government had improved compared to last year. But she criticized the government for its slow pace in upgrading disaster prevention facilities, which made residents in the Inner Harbor area worried. "There are many construction works in Macau, but facilities preventing storm surges and floods are very important, and it's not an excuse to delay by saying they are busy," Lei said. She was also concerned that a long suspension of power and water supply could occur again this time, and she urged the government to do a better job with evacuation of flooded areas.